THE OFFICE OF Public Works (OPW) says that the minimum amount of water was used by a contractor cleaning the Pope’s Cross in Dublin yesterday. The 35-metre cross was being cleaned ahead of the visit of Pope Francis to Ireland next month. However, the use of power hoses at a time when Dublin is under a domestic hosepipe ban raised some eyebrows. However, the OPW says that the work was contracted last month before the restrictions and the work is “essential”. 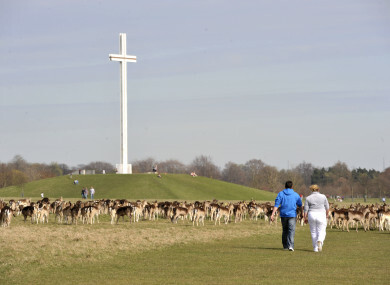 “A contractor was appointed by the Office of Public Works in June to clean down and paint the Papal Cross in advance of the World Meeting of Families event to be held in Phoenix Park on 26 August 2018. This work is deemed essential in advance of the substantial preparatory works required and the event itself as the Cross has not being painted in over four years. The build works on site will commence at the end of July and the painting of the structure must be complete in advance of the start of the works. This event will be attended by approximately 500,000 people and viewed by millions from all around the world on television. “The appointed contractor has been preparing for these works for the past number of weeks and used the minimum amount of water required for this work. The water that was used was drawn off last week before Irish Water put in place a Water Conservation Order. A hosepipe ban is in operation in the Greater Dublin Area as Irish Water makes an urgent appeal to the public to conserve water as much as possible. This means activities such as watering gardens and washing cars are banned. The ban is set to stay in place until 31 July, although it may need to be extended. Email “'Minimum amount of water' used in 'essential' cleaning of Pope's Cross - OPW”. Feedback on “'Minimum amount of water' used in 'essential' cleaning of Pope's Cross - OPW”.